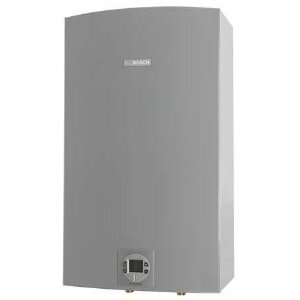 Richmond tankless water heaters are designed as gas-powered, condensing and non-condensing models offering great innovative features for the efficient water heating. 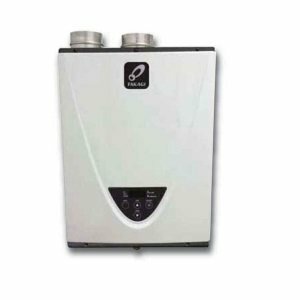 Tankless units are used in residential and light commercial applications, for on-demand and continuous supply of hot water. The article reviews the important features and models. All Richmond tankless water heaters are built to provide an endless and on-demand hot water with the reduced temperature fluctuations, utilizing the high-end technology and several advanced features, which are described below. Richmond tankless models are small and compact in size, and since they are wall mounted, they are great for installations where space is an issue - small apartments and houses, cottages, offices, and garages. They can also be used in whole-house applications where there is a high hot water demand such as the luxury bathrooms with multiple fixtures, hot tubs, and jetted tubs. Models with the energy factor of 0.87 or higher, are Energy Star qualified, and therefore, eligible for government grants and utility rebates, providing even more savings to the homeowners. Condensing types are more efficient than non-condensing models. Condensing water heaters utilize two heat exchangers where one is used for preheating the incoming cold water by utilizing the exhaust gases while the other one – primary, is where the water is heated from the gas burner (non-condensing have only one heat exchanger). This action results in increased efficiency, performance and great savings; condensing models have the energy factor up to 0.94, while the non-condensing, lower, around 0.82. 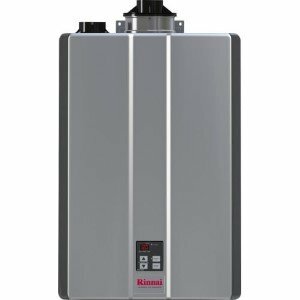 Exclusively made by Rheem and applied for Richmond tankless water heaters are Guardian SBT sensing burner technology, Guardian OFW overheat film wrap, oxygen depletion sensor and the feature that allows high-altitude installations (up to 9840 ft.). Richmond on-demand water heaters are equipped with the Low NOx burners which allow them to emit less pollution during the gas combustion; which is making them eco-friendly and "green." The mid-efficient, non-condensing models heat water resulting in an ultra-low NOx gas emission. Every Richmond model is electronically controlled for precise temperature control, and self-diagnostic, great for maintenance and troubleshooting. The temperature of the outgoing hot water is factory set on 120 F, but by using the remote control you can easily set it in the range from 100 F to 140 F. The temperature and error codes are shown on the digital display of the remote controller. While the largest of Richmond tankless water heaters come with the 9.5 GPH water flow rate, which makes it ideal for larger homes with up to 3 bathrooms, multi-unit capability allows them the usage in high demanding applications. EZ-Link cable allows more hot water production, by linking two Richmond tankless models into one system. For high demanding applications, there is also an option to link up to 20 units by using the manifold control assembly. Condensing indoor models use the 2" or 3" PVC direct venting system for removing the products of combustion from the gas combustion chamber, out, while the outdoor units are ventless. Non-condensing models utilize more expensive 3"/5" stainless steel concentric type vents. The models are factory built to use natural gas but have an option for conversion to propane gas. As it can be seen from the comparison table below, Richmond tankless water heaters come with the gas input between its minimum and maximum value which means that they adjust its power based on the required temperature and water flow - the water heater uses the modulating gas burner and gas valve for this operation. Richmond tankless water heaters come in two groups; non-condensing or mid-efficiency models (Essential Plus series) and condensing or high-efficiency (Encore) - which are bigger and heavier, all available for the indoor or outdoor installation. 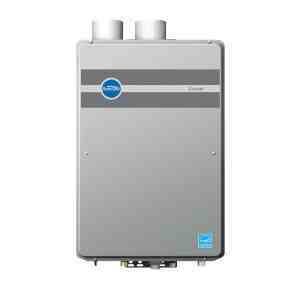 Ultra-efficient water heating with the ultra-low NOx gas emission. Condensing technology and Energy Star compliance. Intelligent electronics control for accuracy, better performance, safety, and self-diagnostic. Multi-unit operation with the EZ-Link system and exclusive manifold capabilities. Long warranty of 12 years and over 20 years expected service. Safety features that include the Exclusive Guardian overheat film wrap and freeze protection. Hot start programming for the reduced temperature fluctuation. Flexible venting with the use of a 2-pipe PVC venting system. Richmond tankless water heaters manufacturer provides a 12-year limited warranty on the heat exchanger, 5 years on the parts and 1 year on labor, while its service life extends to over 20 years. When correctly selected, all the tankless models provide a steady and sufficient supply of hot water as long as you need it and with the constant temperature of the outgoing hot water. Moreover, thanks to the tankless design, the floor space can now be utilized for other use.